Leaf Arrangement (Phyllotaxis): This is how the leaves are arranged on the plant or branch, and is a very good way of starting the identification process. The most common in this book is the alternate. That is, a leaf comes from a leaf node on the plant stem or tree/shrub branch one at a time, alternating from one side to the other. After the alternating, the next arrangement that shows up the most is the opposite. That is, a pair of leaves come from each node of the plant stem or tree/shrub branch - one on each side. Whorled is like opposite, but there are three or more leaves at each node. Decussate is alternating opposite pairs of leaves. This is common in the Mint family for instance. If looking at a plant from above, one opposite pair of leaves would be at 9 and 3 o'clock, and the next pair of leaves at 12 and 6 o'clock. Basal means the leaves come from the ground at the crown of the root. Large numbers of Basal leaves in a Whorl is called a Rosette. There are other arrangements, combinations and variations of each one, but if a plant has them, I explain in the description. The ones given above cover the vast majority of the plants in this book and offer a good start for developing an eye for identifying what plant or tree/shrub you have. 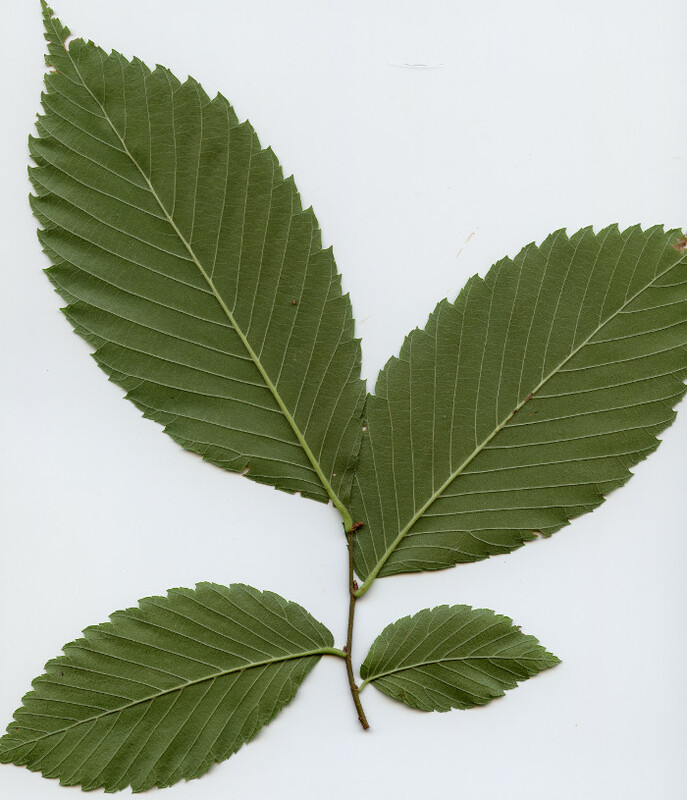 This Elm is a good example of alternate leaves on a branch. This Red Osier Dogwood is a good example of opposite leaves on a branch. Simple vs. 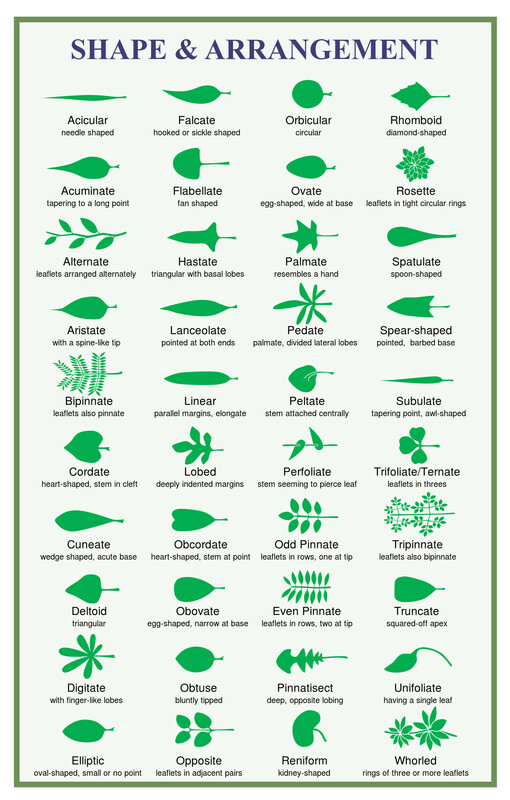 Compound Leaves: You must be clear on the difference between simple and compound leaves. First, go to this link here to see pictures of the two side by side. The easiest way I can think of to describe a simple leaf is: A stem with a single blade of leaf of varying shape. 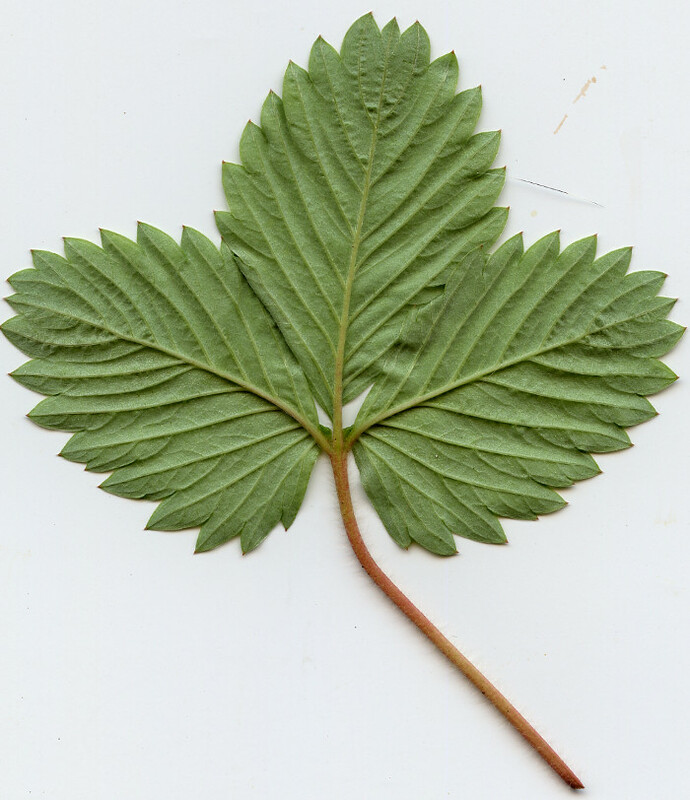 A compound leaf: A stem with two or more leaflets (which look like leaves). This is very important when identifying for at least two reasons. For one, whether a tree has simple or compound leaves is fundamental to identifying. 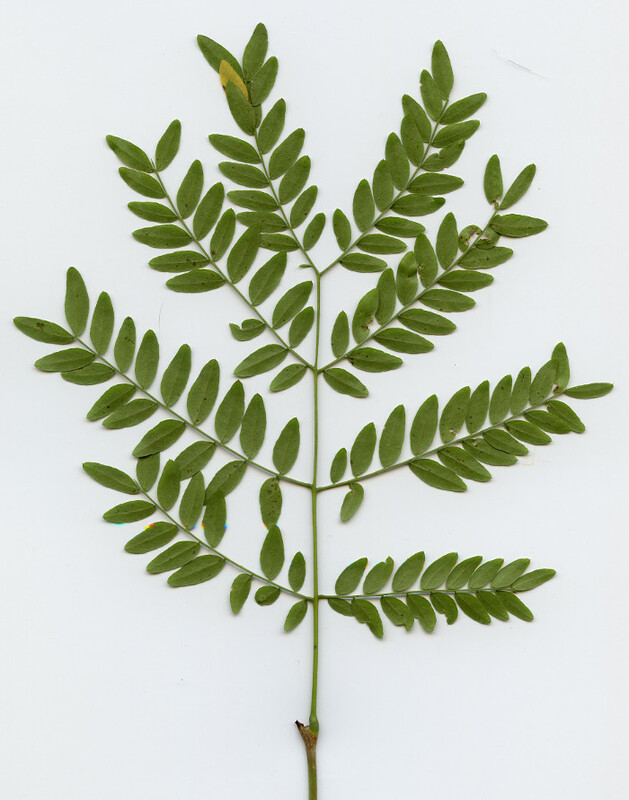 Sometimes the compound leaves could be alternate on the branch, but the leaflets are in opposite pairs on the leaf. If you confuse the leaflets for simple leaves, you would think the leaves are opposite and not alternate, and would definitely misidentify the plant or tree. 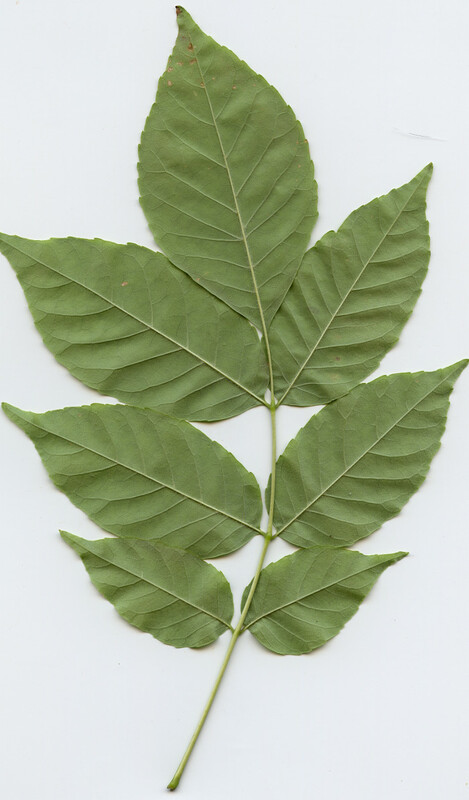 There are a few plants and trees that have double-compound leaves, that is, the leaflets are compound too. An example of this is the Kentucky Coffee tree leaf. See here. Sometimes, a simple leaf has deep lobes which can come so close to the central vein of the leaf, that it looks like a compound leaf. On a compound leaf, the leaflets have stems that attach to the main stem. 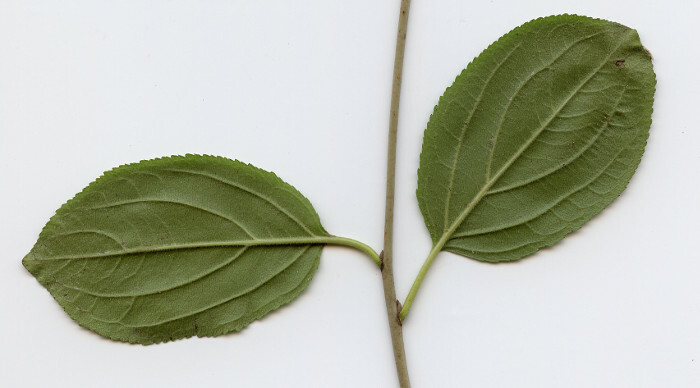 This Common Buckthorn is a good example of Simple leaves. There are two leaves showing on this branch. Compound Leaf Arrangement: These are the five that you should know (there can be others). Odd Pinnately Compound where there is an odd number of leaflets on the leaf, usually opposite pairs along the sides of the leaf stem, and one leaflet at the end. Even Pinnately Compound is the same, but there are a pair of leaflets at the end of the leaf stem instead of one. Palmately Compound is where the leaflets come from the same spot on the leaf stem. 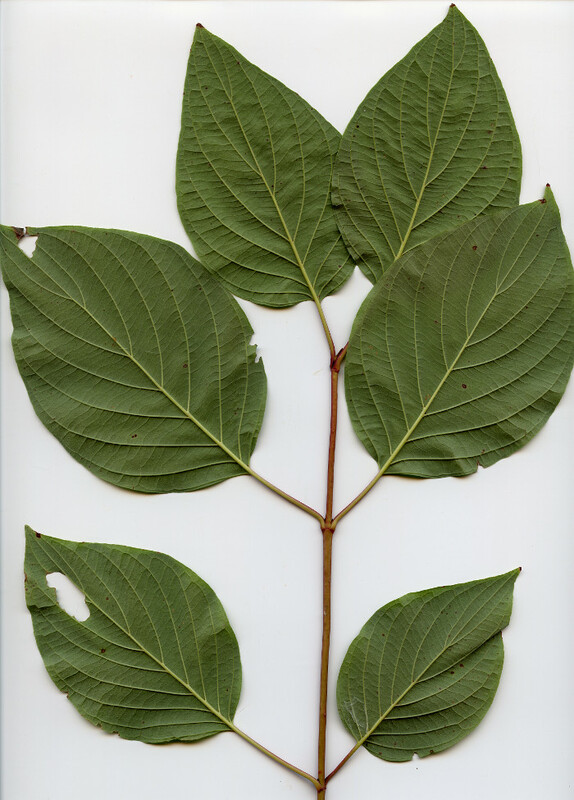 Trifoliate is where there are three leaflets on the compound leaf. Clover is a good example of this. Double Compound leaves are where the leaflets are compound as well. These can have other names based on the arrangement, such as Double Pinnately Compound leaves can be called Bipinnately Compound or "Twice Pinnately Compound". There are others, but the ones above are the most common. If there is a plant or tree/shrub in this book that has other compound arrangements, I will explain in the description. This Manitoba Maple leaf is a good example of a Odd Pinnately Compound leaf. To be clear, this is one leaf with 7 leaflets. In the fall when the leaves fall off the tree, what you see here - the leaf - falls from the tree. If this were 7 leaves on a branch, when fall came, the branch would stay on the tree. This is Odd Pinnately Compound because there is only one leaf at the end giving an odd number - 7 in this case, but it could be 3 or 5 or 9, etc. This is a good example of a Double Compound leaf. Notice that the leaflets are "Even" in this case - instead of a single leaflet at the end, there is a pair. So there are 8 compound leaflets on the leaf. The leaflets on each leaflet are "Even" as well. This Woodland Strawberry is a perfect example of a Trifoliate leaf. 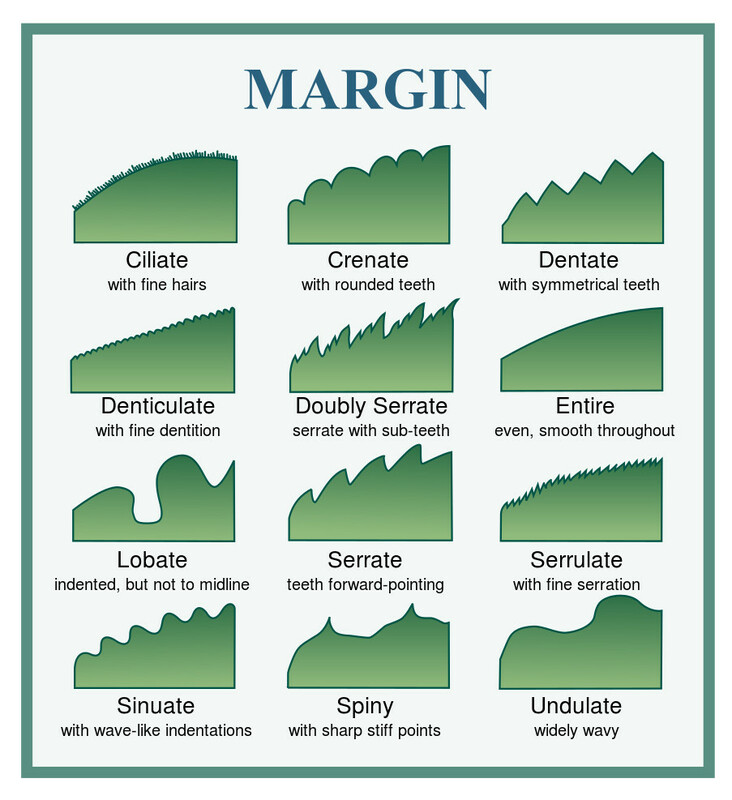 Variability: There can be huge variations in some plants, trees, shrubs, mushrooms that can make identification difficult. It's OK to say you don't know. Better to admit that, then to pretend you are right about something and make a bad mistake. 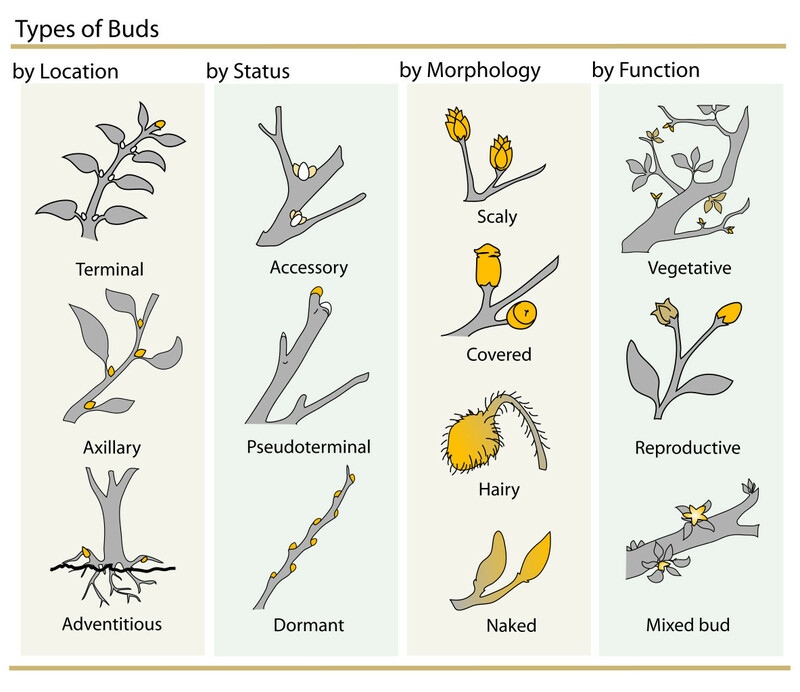 Some plants are different in different environments, some are just highly variable for no apparent reason - Poison Ivy comes to mind, it can take so many shapes and forms it is amazing. 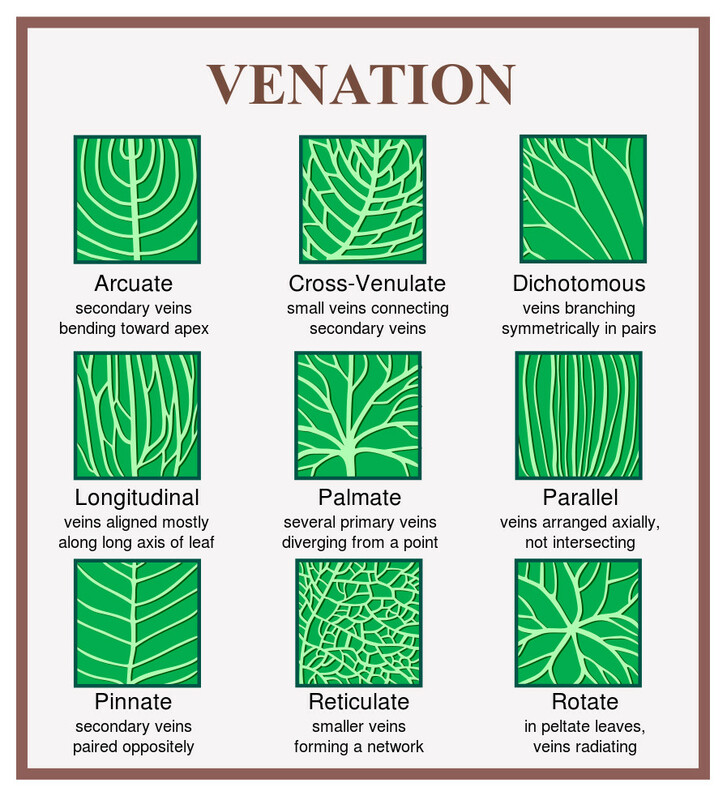 Leaf shapes, heights, leaf size, and on and on can be very different from plant to plant of the same species, sometimes even leaves on the same tree can have radically different shapes. Sometimes, there is a consistency to the variation that you can use. For instance, the Lamb's Quarters plant has diamond shaped leaves when it is young, and oval to elliptical leaves when older. Since the leaves from a younger plant are better to eat by far, knowing this difference is a key point of identification in deciding whether to pick a bunch of leaves for a salad. You will need patience and persistence to get to the point where you recognize a plant on sight. Hopefully, you will take the attitude that you never stop learning. This is so very important when it comes to the most difficult of all to identify - mushrooms. Taste Variation: If you read that a plant has great tasting berries for instance, but you find the plant, identify it correctly, taste the berry and think, "yuk, this is awful", be aware that plants/fruit can have a wide range of tastes for different reasons. 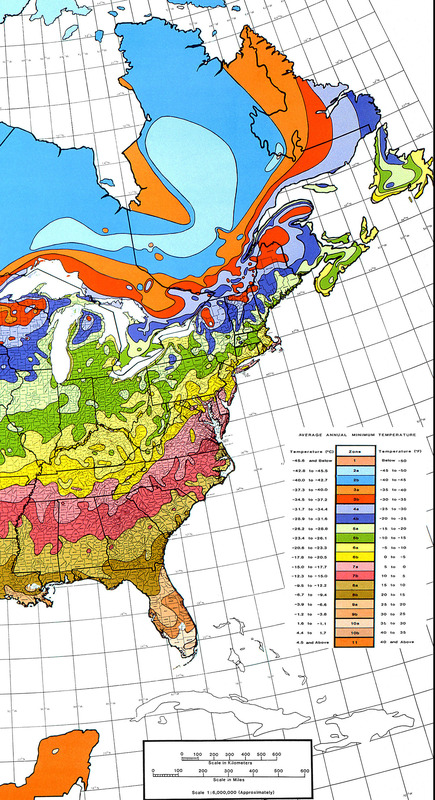 For instance, genetic variation of the plant itself - Apples are known for this, or by the season - Stinging Nettle for instance, location - Milkweed for instance, or climate zone - Paw Paw fruit taste better the warmer the climate they grow in. Don't forever give up on something if you first do not like it. Just make sure you have identified it correctly, always start with the smallest amount to see if you are allergic to it, and keep in mind the issue of variation of taste. Read my experience on the Apples page of the worst thing I think I have ever tasted - an apple of all things! If that had been the first apple I had ever tried, I don't know if I would have tried an apple ever again.